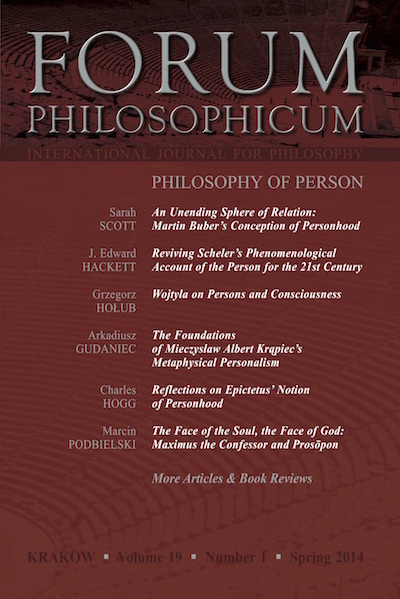 The Spring 2014 issue of Forum Philosophicum offers six papers in which various issues pertaining to the philosophy of persons and its history are discussed. The authors under scrutiny range from Epictetus to Karol Wojtyła. Sarah Scott presents an analysis of the criteria for being a person that Martin Buber put forward in his relatively little-known early writings, including his doctoral dissertation. J. Edward Hackett reconstructs the main constituents of the notion of personhood in Max Scheler. Grzegorz Hołub scrutinizes various apparently disparate claims on the subject of consciousness made by Karol Wojtyła, showing how one can build a consistent and holistic vision from them. Arkadiusz Gudaniec reassembles and synthesizes Mieczysław Krąpiec’s views of persons and personhood, availing himself not only of texts by the late Polish Dominican philosopher (and Rector of the Catholic University of Lublin in the years 1970–1982) published in English in the USA, but also of texts by him that are less well known to the English-speaking philosophical public. Charles Hogg shows how for Epictetus, the experience of death differentiates humans from other living creatures, and how this differentiation parallels the modern philosophical concept of persons rather that the Ancient idea of the “rational animal.” Marcin Podbielski puts forward conclusions from his comprehensive survey of occurrences of the vocabulary of persons (prosōpon) in Maximus the Confessor, presenting, among others, Maximus’ idea of a spiritual “face,” or truly moral human “persona,” which humans can receive through grace as an impression of the eternal paradigms of virtue.